As many as 358 million people in sub-Saharan Africa do not have reliable access to drinking water. Now, researchers have come up with a book on water safety whose pages can be used to filter water. Trials done in 25 contaminated water sites in South Africa, Ghana, Kenya, Haiti, and Bangladesh showed the book, which contains tiny particles of copper and silver, could eliminate over 99% of bacteria, according to results of the project unveiled at the American Chemical Society’s national meeting that began yesterday (Aug. 16th). 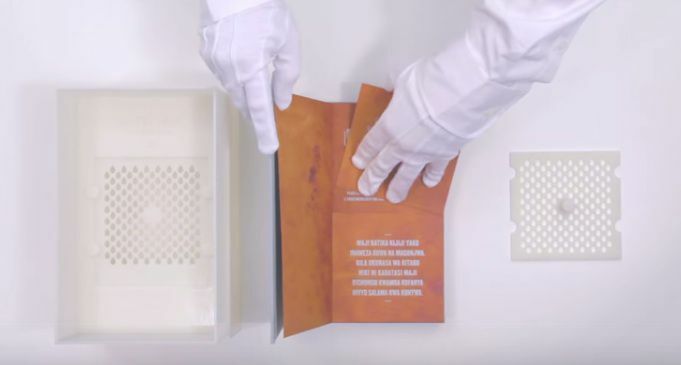 Theresa Dankovich, Ph.D., from Carnegie Mellon in Pittsburgh, who has been leading the research on what she calls “the drinkable book” said in one trial, they tested a ditch contaminated with sewage that contained millions of bacteria. “Even with highly contaminated water sources like that one, we can achieve 99.9% purity with our silver-and copper-nanoparticle paper, bringing bacteria levels comparable to those of US drinking water,” Dankovicz said. The researchers currently make the books by hand themselves—but are now looking to ramp up production and send the books to local communities. Sign up for the World Class Wellness Newsletter and receive helpful how-to’s, tips and advice to make your life more healthy, self-sustaining and successful. This entry was posted in Detoxify, Environment, Global Initiatives, Green Living, Health, Hygiene, Interesting, Sustainable Living, Toxic, Uncategorized, Water and tagged africa, bacteria, book, contaminated, drinkable, filter, nanoparticle, raw sewage, safe water, water. Bookmark the permalink.